Scottish & Irish immigration, with Maggie Loughran. An afternoon session (2pm to 5pm). Book here. Irish rentals (landlords' records) and census records, with Dr Jim Ryan of Flyleaf Press. An afternoon session (2pm to 5pm). Book here. Each of the courses costs £20. Classes are held at the SOG, 14 Charterhouse Buildings, Goswell Road, London EC1M 7BA, UK. 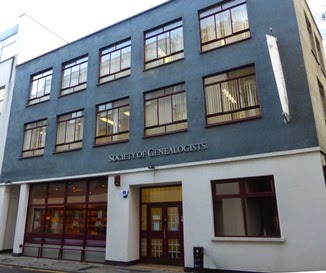 If you're booking for one or both of these courses, why not arrive a little early and pop into the Irish Genealogical Research Society's Library at its temporary home in the SOG building. It opens at 1:30pm on Saturdays (more).